Something I have been waiting for in several years. I made the recommendation more than a year ago in this blog post. Good move and great news! More about Navisworks on my blog. 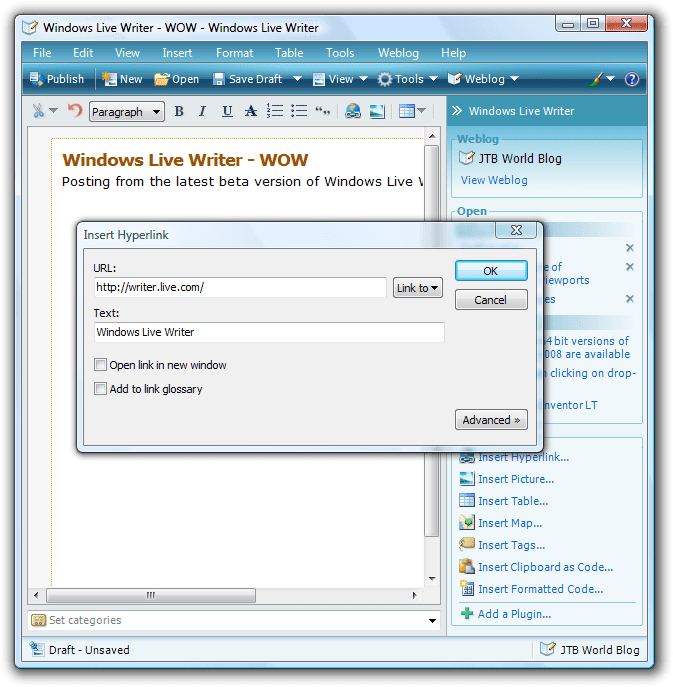 Posting from the latest beta version of Windows Live Writer. Have to blog more to try it out now. It was no problem to install above the existing one. All my drafts and refenty posted posts as well as all settings where retained. Update. I just added tags to existing posts. Works with Google's Blogger as well. DWG TrueView 2008 is found here. "You cannot create add-ons for Inventor LT (technically and per the license agreement)." There is no API. Isn't that the same with AutoCAD LT? And still there are many add-ons for AutoCAD LT that gives access to run AutoLISP and much more. Will the same thing happen with Inventor LT? Time will tell. What about the Tags on the Labs website? Someone having fun? Makes no sense clicking on the tags... But the message is clear Inventor LT should be possible to download from anywhere, I agree on that. Avoid using the function WeekdayName() because it can give inconsistent results. In the Immediate window I looked for the name of vbSunday and it returns måndag (Monday in Swedish). WeekdayName() uses vbUseSystemDayOfWeek and that can change depending on how you have set Windows to behave. Workaround using either Format() or Weekday() since they use vbSunday as default value for the first day of the week or you can select what day should be the first day of the week. This is a problem or bug even in the latest Microsoft Access 2007. If you use a Macrovision FLEXlm/FLEXnet-enabled application and there are problems to pull the network license it might help to use the FLEXLM_TIMEOUT environment variable (has to be added) on the computer that has trouble getting the license. The user might get the dialog box (FLEXlm License Finder dialog box/FLEXnet License Finder dialog box) asking about specifying the location of the license file or license server. Typically this happens when you use a slow dial-up connection but also with a high speed broadband connection it can happen or if you have a network with servers in different countries or far from each other, Autodesk GNUL licenses or the like. In the case of AutoCAD it has been a typical thing needed to do introduced with AutoCAD 2007 and later. Try a value like 1,000,000 as a start and use higher if needed. FLEXLM_TIMEOUT is only working on a Windows PC. Sets the timeout value a FLEXenabled application uses when attempting to connect to a license server system port in the range 27000–27009. Values are in microseconds, within the range 0–2,147,483,647. The default setting is 100,000 microseconds. When you launched AutoCAD 2009 as a non-administrative user using Windows Vista 64-bit, the FLEXlm License Finder dialog box did not display. This issue occurs because the license server path information points to the HKLM\Software\Wow6432Node, which is not accessible to non-administrative users. To resolve this issue, redirect the license server path information to HKLM\ Software \FLEXlm License Manager. FlexNet license reporting tool JTB FlexReport for your License Statistics monitoring and license management. On some pages when there are drop-down boxes IE crashes for me. The below drop-down boxes might not show if you are using a feed reader or get the feed per email. Then you need to open the blog to try it. The one in the middle is making Internet Explorer 7 to crash (you might need to click on it several times). I have Windows Vista so it could be related to the OS as well. The code is the one as showed below. You might need to open the blog for that too. I know Google Reader has some problems with showing it for some reasons. The problem seems to be when the first option in the list uses the selected attribute and there is only one item in the list. SELECTED indicates that the option should be selected by default. One thing I noticed was that if I created a new user account in Vista it works in the beginning but after a while somthing makes the user account infected. I will try if I have time to start one application after another and try to html page in between and see if I can identify it. Update. I found that if I started iexplorer.exe as Administrator so that Protected Mode is Off I don't get any crash. Faulting application iexplore.exe, version 7.0.6000.16386, time stamp 0x4549b133, faulting module mshtml.dll, version 7.0.6000.16448, time stamp 0x45e6595d, exception code 0xc00000fd, fault offset 0x00129d46, process id 0x1828, application start time 0x01c7a27ec4dab403. Faulting application iexplore.exe, version 7.0.6000.16386, time stamp 0x4549b133, faulting module ntdll.dll, version 6.0.6000.16386, time stamp 0x4549bdc9, exception code 0xc0000005, fault offset 0x000652b8, process id 0x16d4, application start time 0x01c7a2853f5a2807. Any ideas for a solution? Do you have this problem? Update: The source for this problem has been identified. Trying F-Secure Internet Security Technology Preview and it found an AutoCAD related file suspicious. The file Acad162_icon.exe you submitted is indeed clean. A database update will be released to resolve this issue. A problem I run into with the F-Secure Internet Security Technology Preview on Windows Vista was that when I tried to stop a virus scan because it took to much process power from other programs running everything slowed down and I eventually had to restart the computer using the button on the PC. I will see if they come up with a solution for that. Would you like to work as Product Manager for AutoCAD? According to Eric Stover, Autodesk. According to this KB article 64-bit Windows operating systems like Windows Vista 64-bit are not tested or supported for NLM based on FLEXlm/FLEXnet that Autodesk products uses. It doesn't mention Windows Vista 32-bit. You probably can install and use it anyway if you read between the lines but according to a source at Autodesk "You cannot install it under 64-bit OSs.". If you have tried and it works add a comment. I know Windows Vista 32-bit works. Make sure that your network license server meets the minimum recommended requirements. See the following table for hardware and software requirements. Author notes: Update all tables with pertinent Windows Vista and 64-bit content. The Network License Manager supports Ethernet network configurations only. The redundant license server model is supported only on Windows 2000 Server Edition and Windows 2003 Server. The Network License Manager supports multiple network interface cards. The Network License Manager uses TCP packet types. What is missing in the help file is that Windows Vista 32-bit is an allowed OS for NLM. It does not say anything officially about Windows 2003 Server Service Pack 2 (SP2). Related post: Upgrade Autodesk Network License Manager for Autodesk 2008 products. DimNotes is an add-on to AutoCAD based products. DimNotes makes it easy to add dimension notes to dimension objects in AutoCAD. The list with notes is saved to a file and can easily be edited. The note can be added to different locations, before, after, above and below existing dimension text. Existing notes can be replaced. Multiple notes can be added. Associative dimension value is retained. You can download and read more about JTB World's DimNotes here. The great NavisWorks JetStream product line has been updated to support Autodesk 2008 products. Our Autodesk product compatibility is improved with Automatic Properties support. Object properties such as volume or cost (stored and shown as mathematical formulae in ADT 2007 and Architecture) can now be viewed as object properties in JetStream v5.4. Here is a problem that probably exists in different scenarios I guess. This happened in my case. I tried to activate Windows Live OneCare subscription online when traveling in another country than my credit card is issued in. I couldn't even purchase a new license if I wanted to. The website sees from the IP that the country you are in and the country of your credit card does not match and denies you to purchase. All I got when I tried was a website with this information. If you get this message more than once, report it as a recurring problem. Lesson is that make sure you don't need to update the subscription when you travel to other countries. If you have a created a template with annotation scales using the SCALELISTEDIT command and want to add them to an existing drawing here is what you can do to save some manual work. The scale list is stored separately in each drawing in AutoCAD 2008 and forward. In older versions they where saved in the AutoCAD profile. What happens here with this line of AutoLISP code is that the block/drawing template is inserted into the current drawing and exploded, the block definition is not added but the annotation scales are added. Make sure to change c:\\your\\path\\template to the location and the name of your template. It can be either a DWG or a DWT file. Then if you have several existing drawing you can use a batch script application like SmartPurger or ScriptPro. If you want the scales added to all your drawings that you open you can create or edit the acaddoc.lsp file. JTB FlexReport 3.2.8 was released 2007-05-09 as result of customers requests. Keep them coming. JTB FlexReport Graphic Reports.xls can automatically have the data refreshed when opened using the Auto refresh option set to -1. Download for the xls file only. JTB FlexReport Detailed Reports.mdb reports includes a column for user and host groups and has fixed an issue with the end date not being included on the reports. Download for the mdb file only. You can use Visual Studio to automate the free Autodesk DWG TrueView application. Select Choose Items in the Toolbox and add the COM Component "C:\Program Files\DWG TrueView 2008\AcCtrl.dll". Now it can be added to a form. Here is how the most simple code can look like with VB.NET to open and view a DWG file using TrueView. I have in Windows XP had a simple html home page for Internet Explorer that is located on the local hard drive with a lot of links. But when using the same in Windows Vista a security feature annoyed me. Every link on the home page opens a new window. Open in new tab is not even available. If I take a link to a website and paste it into the address field the following dialog box shows up saying: Internet Explorer needs to open a new window to display this webpage. For your computer’s security, websites that are in different security zones must open in different windows. The solution to this problem is to add The Mark of the Web (MOTW) to the HTML page. The comment above was added after <html>. Now my local home page runs in the Internet zone and the link works as expected. 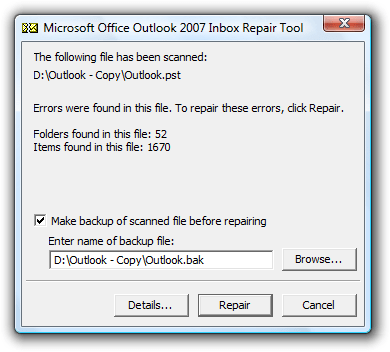 I got no results (or limited result) returned when searching for e-mail items using Instant Search in Outlook 2007 on Windows Vista. I run it on all PST files and there where errors found in all of the files. I also run a rebuild of the index just to be sure and it seems like using the Inbox Repair Tool was the solution to the problem. But the irritating thing is that after a few days the PST got corrupted again. 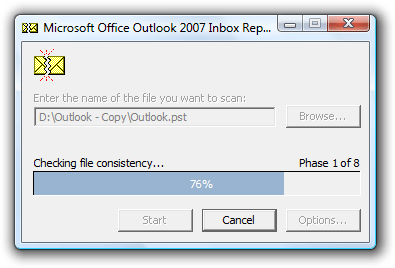 Outlook should really be better at notifying when problems arise like this. If you have an AutoLISP file that does not work or exits like the sample below there might be an easy solution. Try running (vl-load-com) or add it to the beginning of the LSP file. Now it works as expected without any errors. This function loads the extended AutoLISP functions provided with Visual LISP. The Visual LISP extensions implement ActiveX and AutoCAD reactor support through AutoLISP, and also provide ActiveX utility and data conversion functions, dictionary handling functions, and curve measurement functions. It does not hurt to add (vl-load-com) to your LSP files to make sure it works. If the extensions already are loaded (vl-load-com) does nothing. If you want to know more about Sortents. It has been missing in the documentation for a while. The usage of it has also changed so some of the bits are obsolete in newer versions of AutoCAD. So, setting the 4/8/64 bits has no effect anymore, but we still use 127 to turn everything on for consistency. For the 4 remaining in-use bits, turning that bit OFF will DISABLE the user-defined draworder (set by the DRAWORDER command) for that operation. I just tested selection/regen/plot and indeed you can independently disable draworder for each of those (not sure how to test the Osnap draworder bit, but it’s still referenced in the code, so it probably works). When it’s disabled, you fall back. So SORTENTS is very much NOT obsolete, just not advertised any more–if somebody went to trouble to assign draworder, it should stay on. But performance on huge drawings with draworder applied is one reason why you might want to disable it sometimes. - Changing a SORTENTS bit takes effect immediately except for the Regen bit, which requires a REGEN. - When a bit is disabled, you fall back to database order (oct-tree ordering in 2D). AutoCAD 2008 discussion group thread on the subject. I got an email from a person that wondered how to "provide the state of a toolbar, either Hide or Show" using AutoLISP. Here is how it can be done. If you want to do basic modelling (only parts, not assemblys) using Inventor now it's the time because the bar is really lowered. Take a look at AILTTP (Autodesk Inventor LT Technology Preview) or whatever acronym will be used. Free Autodesk Inventor LT Technology Preview Now Available on It’s Alive in the Lab. If you want to use the Layer Translator command Laytrans in a script file (SCR) or an AutoLISP file (LSP) here is how it can be done. <file name> is a required argument. It is the name of a dwg or dws file that contains saved layer mappings. This file would need to have been created during a manual translation operation with Layer Translator. [<bits>] is an optional argument. This is a bit code sum indicating which options should be used during translation. These correspond to the same options in the Settings dialog in Layer Translator. If the argument is not provided, the function uses the Layer Translator dialog's last settings. Uses the previously saved file "standard.dws" (which contains layer mappings) and the last used options. Uses the previously saved file "standard.dws" and forces color and linetype to BYLAYER. Uses the previously saved file "standard.dws", forces color and linetype to BYLAYER and writes a translation log. Make sure that laytrans.arx is loaded and use bit 1 and bit 4. I wonder why caution should be exercised according to this Autodesk KB document. Autodesk product licenses have not been tested for use with Macrovision FLEXNET™ Manager. As such, the use of Autodesk product licenses with Macrovision FLEXNET Manager is not supported and caution should be exercised if you are considering using this product. Autodesk product licenses have been tested and are fully supported only on Macrovision FLEXlm™ software. Using FLEXnet Manager, organizations cut software spending by up to 35%, simplify license administration, keep software compliant, and ensure end users have access to the licenses they need to do their jobs. If you can afford FLEXnet Manager go for it. If not, consider the less expensive alternative JTB FlexReport from JTB World. As a JTB FlexReport user you have better chance to have opinions the software functionality.